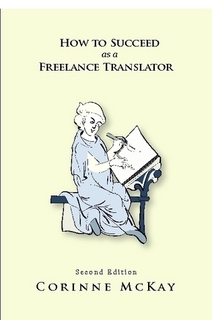 Home / Announcements / Second edition of "How to Succeed as a Freelance Translator" is here! I’m excited to announce that the second edition of How to Succeed as a Freelance Translator is officially available on Lulu; it will be available on Amazon and in retail locations in about 6-8 weeks. Thanks to everyone who made the first edition such a success; my vague goal when I published it in 2006 was to sell 500 copies, and it is being sent to a well-deserved retirement with 4,366 copies in print as of today. Note that for the moment, the second edition is available only from Lulu; other sales channels still have the first edition. If you are a translation blogger or a journalist and you would like a review copy of the second edition, please contact me. So what’s new in the second edition? Well, it’s 206 pages long (as compared with the first edition’s 145 pages) and all of the information from the first edition is fully revised. There’s a completely new chapter on “Your first year as a freelance translator,” another on “Online networking and social media,” separate sections on marketing to agencies and marketing to direct clients and a sneak preview of my next book, a compilation of articles from this blog that will be out later this year. Thanks to everyone who was so supportive during the long and arduous process of taking this book to press. I’m not sure why it took me longer to write the second edition than to write the first, but in any case it’s here! Yay! Congrats, Corinne! I do have an advanced copy, and am very excited. Thanks Eve! After all of your encouragement (and listening to me anguish about the second edition for only two years…) it was a privilege to give you the first review copy! It probably took you longer to write the second edition, because your time is much more in demand due to the first edition. Congrats on the new book. Thanks for your comment Ellen! It took me about 2 years longer than I had planned to release the second edition, so I think I stopped talking about it at some point… Definitely let me know how you enjoy the book. I am keen to sell your book in India. Please let me know what should i do.. Thanks so much for your comment! Right now the book is available only through the distributor, Lulu Press (http://www.lulu.com). It should be on Amazon and other major retail sites in about 8 weeks. I read the second edition (and the first edition) and loved all the updates. I have already referred to it several times so it is very valuable for experienced translators too, plus recommended it to new translators. Congratulations on a job well done! Thanks Tess! I’m really glad you enjoyed the second edition. It feels good to have it finished, and even better that people are enjoying reading it! And thanks so much for recommending it to new translators, I really appreciate the referrals. Congrats on the new book! Will there be a Kindle edition also available? I agree with Tess, from what I’ve read so far, it’s got great tips for experienced translators as well as beginners. I’ll continue to recommend it as a must-read for my translation students :). Just wanted to thank you for running this blog and posting wonderful insights into profession. I work in-house, mostly, as free-lance in my country is road not always easily traveled (mainly in terms of accounting), but I’ve found some of your tips useful even when dealing not with a client, but with the boss:) . Thanks. Thanks Yanina! That is a market that I hadn’t even thought of…thanks for the tip and best of luck with your own work (and your boss!). Congratulations on your second book! I taught Introduction to Translation and Interpretation @ UCSD Extension for 6 years and have been recommending your book to all my students. It is a must read for translators- in – training. Thanks Andy! That’s very kind of you to say. I hope you enjoy the new edition! I’ve read it. Great job. I can’t put my finger on why I like it even better than the first edition. I’d have to go back and read that again to compare. In any case, it was an easy read – I zipped through it on a sleep-free trans-Atlantic flight, and I will continue to recommend it as my first choice of book to purchase for new and aspiring freelancers. Well done Corinne. Writing this is a service to the profession, and you set a great example for freelancers of a way to diversify. Thanks Karen, that is so nice of you to say. Glad to provide some entertainment on your trans-Atlantic flight! I did clean the writing up quite a bit from the first edition; killed a lot of passive voice, overly long sentences, etc. And yes, diversifying is nice; I won’t be retiring on the book royalties but the first edition paid for some fun vacations! Thanks Jose Antonio! It’s always great working with you too. Definitely let me know what you think of the book! Congratulations! I have read some of the Jenner book, so I will be excited to read yours as well in the coming weeks. It’s very satisfying finishing a book and getting it ready for publication. Here’s to the future success of this, your next book! Thanks Andy! Yes, it feels good to have it out the door! It is already offered at Amazon.com. Taking my first steps as a freelance translator and after enjoying your posts, this sounds like my next book to read! I apologize for the mistake, I have to take my words back. Amazon.com only has the 1st edition available per Corinne’s clarification, a few more weeks yet to come before it becomes my companion!